This is Part 3 of a three part discussion on current asymmetry. It may aid understanding if Part 1 – Causes and Effects of Current Asymmetry on Wind Farms and Part 2 – Recommendations for Reducing Current Asymmetry on Wind Farms are read first. A wind farm had high levels of current asymmetry both at the turbine level and the PCC. The wind farm is connected to the grid via a radial line (owned by the network service provider) which is not transposed. It develops significant voltage imbalance at high wind farm output. Wind turbines were frequently tripping due to current asymmetry. Phase transpositions were performed with the primary aim of reducing current asymmetry and the hope that voltage imbalance and harmonics may also improve. Because of the weak grid connection, it was theorised that if some current asymmetry was originating from within the wind farm, phase transposition could be performed such that the phase with the maximum current at the wind turbine (low voltage) level could be more evenly distributed across each of the phases at the medium voltage level. An indicative single line diagram of the substation is shown below. The wind farm has four collector groups (CG1-CG4), each containing approximately eight wind turbines. The two longest collector groups were chosen for phase transpositions where the cables entered the main switchboard at the substation. The initial concept was to achieve a balance of phasing across the wind farm. One long collector group to be phased BCA, another long collector group phased CAB and the remaining two shortest collector groups retaining their original ABC phasing. Unfortunately, due to the way the MV cables were run during construction, it was not possible to perform the phase transpositions at the substation (refer recommendations) – they were performed at the MV switchgear of the first turbine on that collector group. 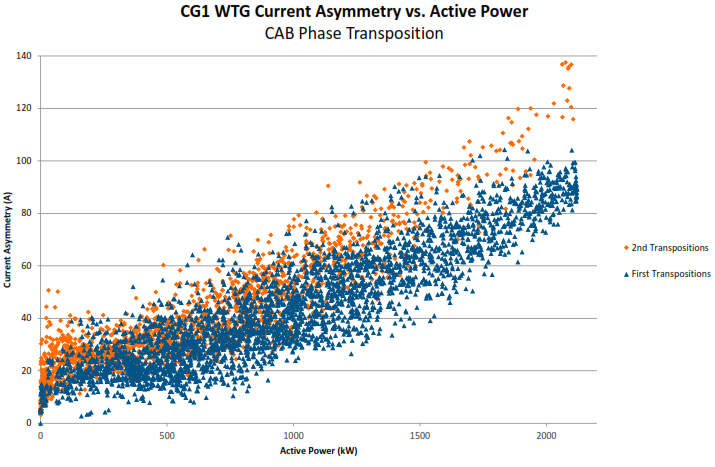 Initial results showed that CG2 which underwent BCA phase transposition saw levels of wind turbine current asymmetry reduce to below 30% of original values while CG1, which underwent CAB phase transposition, showed only minor improvement. No measureable improvement in voltage asymmetry or harmonic levels was detected following the initial two phase transpositions. The phase with the maximum current changed from Phase B to Phase A. The above two features imply that there is more than one source of current asymmetry. WTG current asymmetry improved (rather than just a shift of the highest current from one phase to the other). But a mechanism upstream of the transposition (e.g. PCC voltage asymmetry) was still influencing current asymmetry at the wind turbine generator. 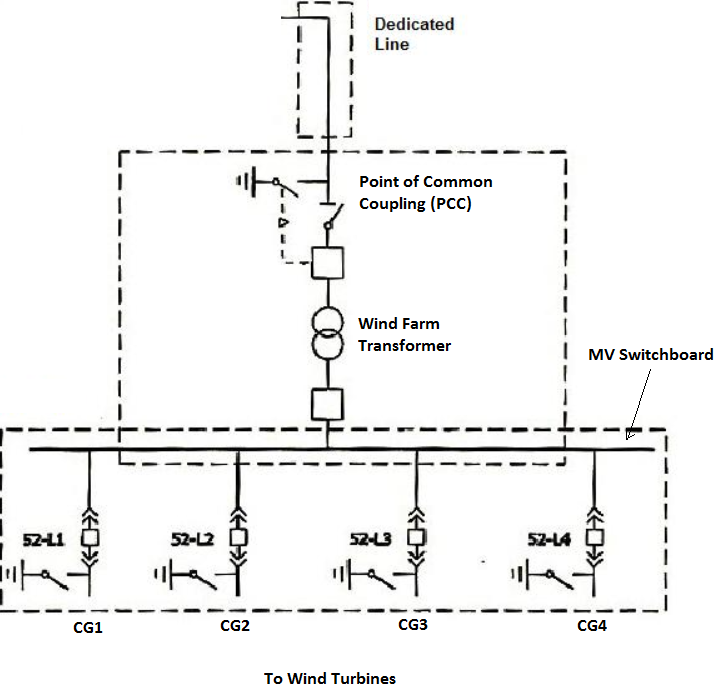 The highest current at the turbine was on Phase B (which had previously been connected to Phase B in the distribution network). This was now connected to Phase A in the distribution network. Correspondingly, now Phase A at the turbine had the highest current. Possibly the wind turbine transformer impedance encourages higher current on Phase B and the distribution network does too – they may both have lower impedance on their centre phases (Phase B) due to the mutual inductance of the windings/lines on either side (discussed in more detail in Part 1). Performing transpositions on the collector group meant that these two mechanisms were no longer both working together to increase current on Phase B. 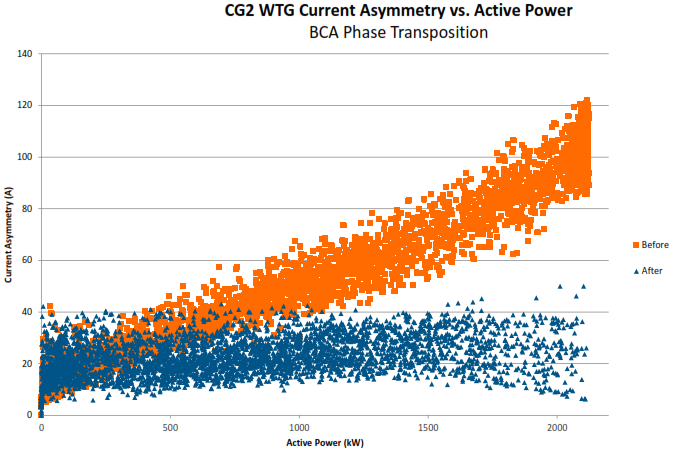 Because the BCA phase transposition resulted in significant improvement, additional BCA transpositions were performed on the two collector groups which were originally planned to retain their ABC phasing (CG3 and CG4). This time the improvement in wind turbine steady state current asymmetry on CG3 and CG4 was close to 50%. 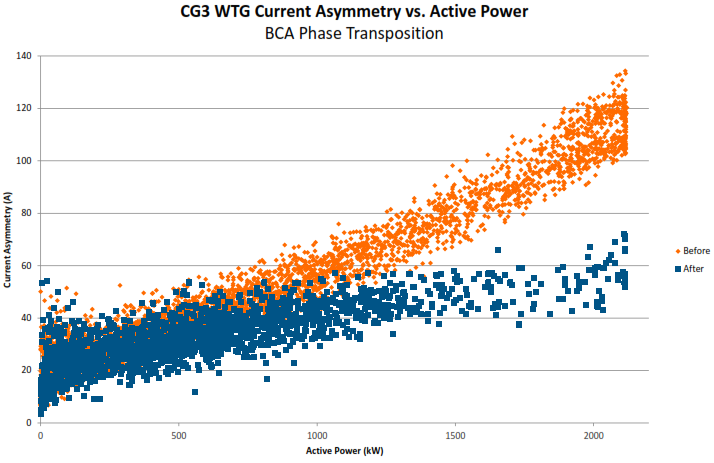 BCA phase transpositions to three quarters of the wind warm (CG2, CG3 and CG4) improved wind turbine current asymmetry. In this case, operating with an even number of collector groups with ABC, BCA and CAB phasing would not result in current asymmetry minimisation at the wind turbine level. However CG1 current asymmetry increased to levels close to those before performing any transpositions. 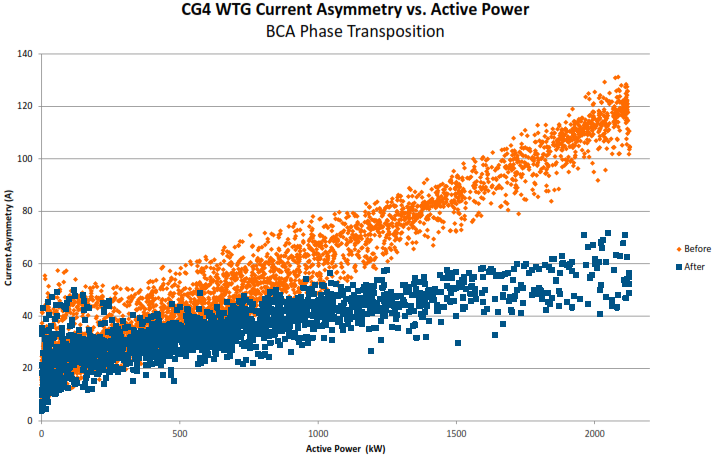 CG2 current asymmetry – which had reduced to around 30% after the initial transpositions increased to around 50% of original levels. 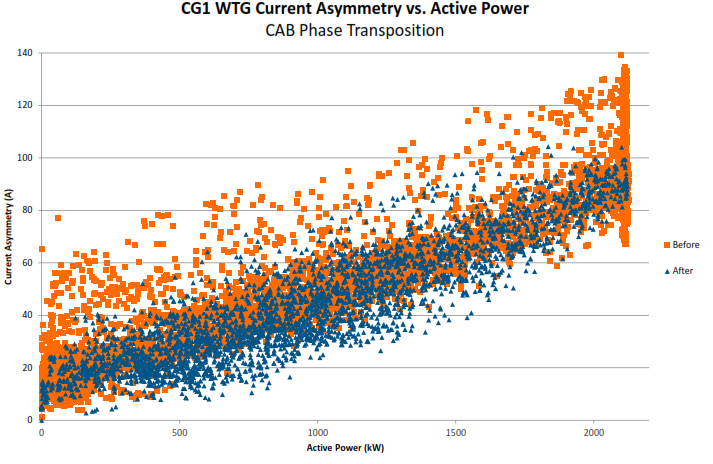 Wind turbine current asymmetry increased on the initially-transposed collector groups (CG1 and CG2) following the second set of phase transpositions. CG3 and CG4 were also transposed to BCA. Overall current asymmetry remained far below original levels measured when all collector groups were phased ABC. Following the second round of phase transpositions, three out of four collector groups were phased BCA and the other CAB. Voltage asymmetry still had not improved. Performing the transpositions at the substation may have improved voltage imbalance at the medium voltage switchboard. This would be due to voltage dropping along the length of cable between the substation and the first turbine on each collector group. The phase with higher current would have experienced slightly more voltage drop. This voltage drop may have acted to balance the connection point voltages. Voltage and current asymmetry as measured by the Elspec meter fitted at the PCC. PCC asymmetry did not noticeably improve following the collector group phase transpositions. Wind turbines on the wind farm have a noticeably increased resilience to current asymmetry trips. 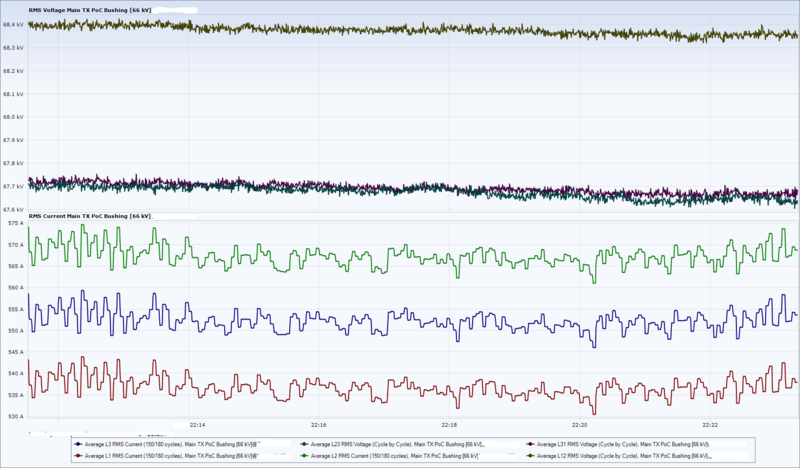 Unfortunately analysis of the wind farm SCADA data found no detectable decrease in generator temperature (often the initiator of wind turbine power constraints at periods of high outdoor temperature) following the current balancing improvements.